Each month we are given the opportunity to wish for a prive box. What that is, is a box featuring a specific brand. First let's take a look at what our prive options were for September. Amika Prive Topbox - Freshen dirty hair, create extra volume, and extend your beautiful blowout with a touch of Amika's Perk Up Dry Shampoo. The only dry shampoo on the market with no aluminum (phew!) and no talc, once you try it you'll never go back to your old stuff. Bioderma Prive Topbox - Take advantage of the latest dermatological breakthroughs. Sebium Al Correcteur promotes the elimination of pimples through multi-targeted action and brightens the complexion thanks to its natural colouring. China Glaze Prive Topbox - China Glaze unique lacquers contain China Clay as a nail hardener, the same material that gives porcelain its shiny finish. These glossy lacquers are phenomenal for lasting strength, durability, and overall gorgeous nails. Lise Watier Prive Topbox - The highest concentration of exclusive Labrador Tea extract in a fast-results, age-defying serum. The Active Cell Infusion Complex boosts the efficacy and absorption of actives to deliver them where skin needs them the most. With every application, a powerful dose of active ingredients penetrates into the skin to reverse already-visible signs of aging, improves skin's resilience and fight skin aging. MaskerAide Prive Topbox - MaskerAide eye gels are packed with super hydrating, brightening, and firming ingredients that includes their unique 100 Herb Complex formula and Hyaluronic Acid that will give you a long-lasting moisture boost. These hydrogel eye patches contour to your face to effectively deliver our fab ingredients to your eye area, while instantly awakening, soothing, and depuffing. The perfect all in one eye treatment! Mereadesso Prive Topbox - The tinted all-in-one moisturizer travel size is everything you need to keep your skin looking and feeling its best on the go. Nourish your skin, cover your blemishes, and never worry about combining multiple products again. It felt like there was a good selection of products this month for prive boxes. Something for everyone. 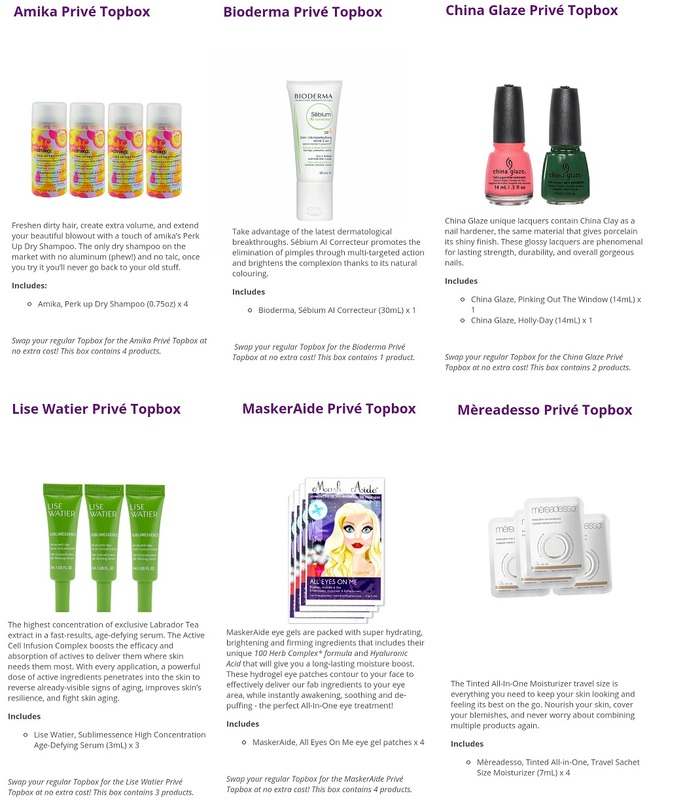 I was slightly interested in everything except for the eye gels because I have tried them previously and did not like them. I'm not a fan of green polish, but everything else was acceptable. 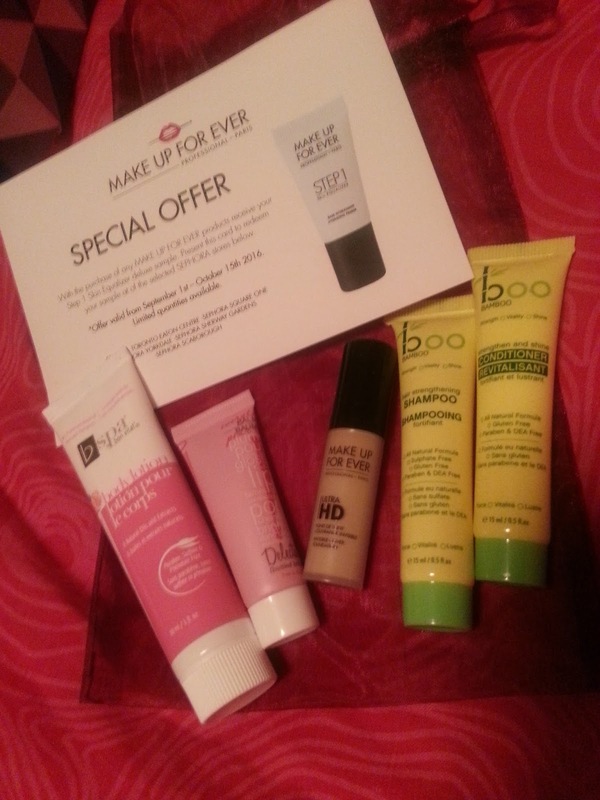 However, I ended up wishing for a regular topbox. Sometimes you end up getting really awesome products when you choose the regular box, plus you get a nice surprise in the mail. This came in the scent pink grapefruit. I love grapefruit scented products! I haven't opened it up yet to give it a try, just because I have a ton others I need to finish up first, but I look forward to smelling this! This naturally derived, petrolatum-free, multi-purpose beauty balm is designed to hydrate, smooth and condition everything, from lips to fingertips. Again, I haven't opened it up yet, but it sounds interesting! I've heard great things about MUF, but I've never tried their products. I was excited to see this in my bag, but a little sad because I just knew it wouldn't be the right shade. I haven't swatched it just because it looks too dark in the bottle. Swatches online make it not look so dark, but it still looks too yellow/dark for me. I will have to pass this on. Ah, I have so many shampoo and conditioner bottles to get through. From full size, to travel size, to even foil packs. I have so many! I haven't opened these up yet just because I started a new shampoo/conditioner just a few days ago, but I will eventually get to them. I do like that they are a natural formula, and cruelty free! Also, made in Canada! And, as if this post wasn't long enough! 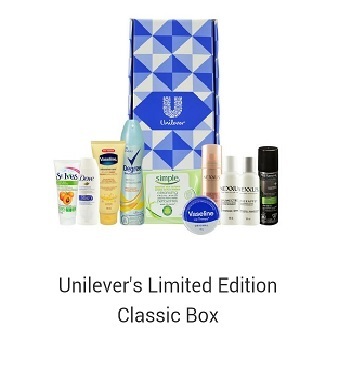 Topbox also sent out some complimentary Unilever boxes. It was a great surprise! There were two being sent out (or also available to purchase for $10) and I received the Classic box. I don't have a better picture cause I pretty much ripped it open and tossed all the samples into a bag. But I will make a list of everything that was included. Everything will eventually get used up and I thought it was very generous of Topbox to send these for free!